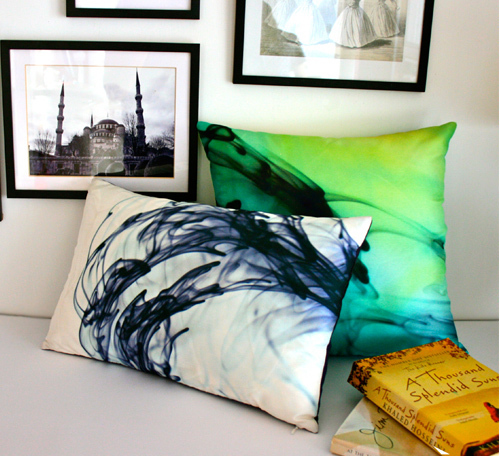 I love all of the abstract watercolors out there in the design world currently in both fashion and home accessories so when Trupti Bane from Mohh Designs contacted me to share her pillows, my eye immediately fell upon this lovely pair below. Mohh is a Sanskrit word meaning desire and for Trupti, you feels a strong desire to be around beautiful things in the home and to share them with others. She designs all of her cushions and digitally prints them onto raw silk. The colorful, contemporary designs are inspired by Trupti's travels and Asia design and she is looking for both wholesale and retail opportunities so that she can reach more people with her designs. Big News: Decorate Book Tour Details!